Allied has agreed to a Montana collision repairer’s interpretation of the CCC “bumper prompt” after what seems like a refusal that tried to have it both ways on CCC guidelines. Helena, Mont.-based Capital Collision Center had answered “Yes” to the controversial CCC question, “Will the bumper be refinished in a separate procedure from the other panels?” because flex additive was necessary for the part. “All panels or components for which paint systems require a flex agent added to the paint mix. Example: fascia covers, fillers, extensions, spoilers, etc.,” CCC’s Motor Guide states. Those wanting to learn more about issues related to this article should check out “Getting Paid for Investing in Facility, Equipment and Training” with Tim Ronak of AkzoNobel, “Paint Shop Performance” with John Fagan of PPG and “Don’t Let Consolidators and MSOs Steal Your Insurance Work” with Michelle Nelson of B2B Automotive. The presentations will be at this year’s SEMA Show as part of the Society of Collision Repair Specialists’ Repairer Driven Education series. Register here. An adjuster for Allied, a Nationwide subsidiary, challenged the response. He also allegedly told Capital, “’I have never allowed ‘yes’ on the bumper prompt, and I’m never going to,’” according to owner Bruce Halcro. Halcro, a Society of Collision Repair Specialists board member, pointed out in June that Capital was answering as accurately as it could given the “Yes/No” nature of the prompt, and cited CCC’s own language. Allied’s adjuster ultimately said, “You win,” according to Halcro. But he’d also contacted the Montana Department of Insurance in the dispute, and agency Chief Counsel Jesse Laslovich wrote to Allied/Nationwide to check if the insurer had changed its behavior statewide. Each vehicle and estimate is evaluated on an individual bases in regards to the bumper prompt provided within the CCC One Estimating System. 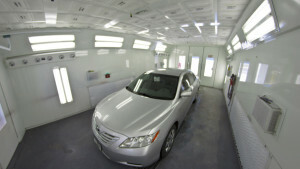 There are several paint manufactures available for the body shop to utilize and each shop may have a slightly different paint process based on the manufacturers recommendation. The answer to the bumper prompt will depend on the shops paint process and procedures that they use in their facility. If a bumper is “refinished in a separate procedure from the other panels” as indicated by the prompt we would answer “Yes”. If the bumper is painted with the vehicle (but not on the vehicle) in the booth at the same time we would answer “No”. I hope this clarifies Nationwide Insurance and it’s affiliates utilization of the CCC One Bumper Prompt and complies with MCA 33-18-224. If you have any additional questions or concerns please let me know. “They’re twisting it around,” Halcro said. CCC saying a procedure is separate should mean “that’s the end of that story,” he said. The Montana Insurance Department accepted the insurer’s answer, according to Laslovich. Based on this experience, shops should challenge insurers when the P-pages back them up, though of course it helps when state law holds the parties to the estimating service of choice’s language. Halcro raising the issue appears to have changed Nationwide and Allied’s behavior. “I do know they deal differently with us now,” he wrote in an email.